The Royal Caribbean Oasis of the Seas cruise ship is cutting its journey short after 475 passengers and crew members have been infected with a norovirus, Royal Caribbean Cruises announced Thursday. The cruise line initially reported on Thursday that more than 250 passengers had fallen ill.
"We think the right thing to do is to get everyone home early rather than have guests worry about their health" the cruise line said in a statement, adding that returning early "also gives us more time to completely clean and sanitize the ship before her next sailing." Guest and crew members began getting sick when the ship departed the Port Canaveral in Florida on Jan. 6. The ship, originally scheduled for a seven night cruise, made its first stop in Haiti Tuesday where the ship hosted a lunch buffet on land, said Abby Perrin, a passenger on the ship told ABC News. That night, Perrin said she and her mother began experiencing symptoms associated with food poisoning, like vomiting. The next day, the ship arrived to Jamaica, but passengers said they weren't allowed to leave the vessel. Thursday morning, the ship headed for its next scheduled destination in Cozumel, Mexico, but officials canceled the cruise while it was still en route. Now it is on its way back to Florida. "It was pretty upsetting that we weren't able to get into Jamaica at all," Perrin said. "Then we were supposed to be in Mexico tomorrow, which we were really excited about, and it turns out we're going back to Florida instead." About three percent of people aboard the ship are affected by the norovirus, according to the cruise company. Alan Thomas is currently aboard the ship with his spouse and two friends. "People are still getting sick," he told ABC News. "At a cafe next to Guest Services last night, there was a kid vomiting in the trash can." Thomas shared a video on Twitter of crew members cleaning the ship. He told ABC News that crew members are not allowing guests to serve themselves food or drinks. Norovirus is a contagious virus that causes vomiting and diarrhea. A person can become infected through having direct contact with another infected person, consuming contaminated food or water, or touching their nose and mouth after touching contaminated surfaces, according to the Centers for Disease Control and Prevention (CDC). Norovirus is the leading cause of foodborne illness in the U.S., according to CDC. It is not yet known what caused the outbreak, but most instances of norovirus occur in food service settings like restaurants, according to the CDC. 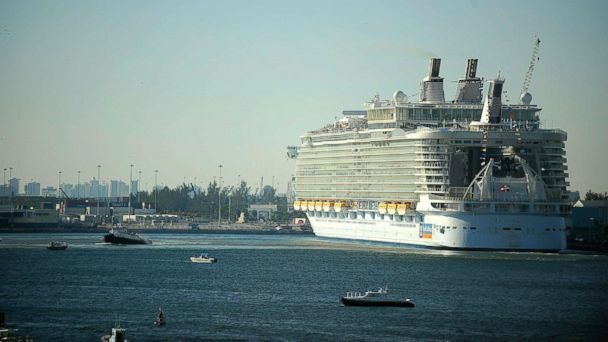 The Royal Caribbean advertises the Oasis of the Seas as one of the world's largest ships. In 2017, about 220 passengers aboard a five-night Royal Caribbean cruise suffered from a gastro-intestinal illness. All of the current Oasis of the Seas passengers will receive a full refund, Royal Caribbean Cruises said in the statement. "Our guests sail with us to have great vacations, and we are sorry this cruise fell short," the statement reads. The cruise company said the ship is scheduled to return to Florida on Saturday. ABC News' Julia Jacobo, Rachel Katz and Brendan Rand contributed to this report.